Show kicked off with the voice of Vendetta Pro, Joseph Duncan welcoming everyone to the show & reminding everyone that they’ll be having another show on Sunday, May 11th right back here at the Pop Expo. “The Classic Connection” (“The Ace” Buddy Royal & “Unorthadox” Levi Shapiro) & Alexander G. Bernard def JD Horror, Clay Towzer & TL the Insano when Royal school boy pinned TL. “The Fallen Flower” Kikyo Nakamura def “The Terra-dactyl” Terra Calaway when Calaway had Nakamura in a “Hells Gate” Triangle Choke but Nakamura was able to position herself to pin Calaway with her feet on the ropes to win. The Ballards Brothers (Shane & Shannon) def Global Assault (Max Ammo & “Shogun of Harlem” Jimi Mayhem w/Bam Bam) when one of the Ballards school boy pinned Mayhem to retain the championship. Jacob “The Riot” Diez (w/Lizzie Sunshine) def Vintage Dragon with a running Michinoku Driver for the win. Kadin Anthony (w/Lady Vayne) def “The Vampire Warrior” Gangrel with a roll up to retain the championship. As we were about ready for the Main Event, “The Apostle” Judah Matthews makes his way to the ring. He grabs the mic & called everyone in attendance “Sinners” & if they want to grab some “magic”, grab the good book instead of a magic card. He then would proceed to challenge anyone in the back to a match & GWAR’s Techno Destructo answer the call. Techno Destructo (w/Discord & Cardillia) def “The Apostle” Judah Matthews by countout. Colt “Boom Boom” Cabana & Sunami def “The Metal Head Maniac” Sledge & Vendetta Pro Underground Champion “The Freak” Jeckles the Jester when both Cabana & Sunami doubled pinned both Jeckles & Sledge after hitting finishers on them both (Sunami with a Death Vally Driver on Sledge & Cabana with a GTS on Jeckles) for the win to end the night. This was my 1st time attending a Vendetta Pro show live & unfortunately it wasn’t a successful show. Nothing against Vendetta because I’ve seen through online events that they sell out venues & have top matches at their shows but due to the fact that the 1st day of the Pop Expo event didn’t draw the attendance as most Comic Conventions do in So Cal, it hurt Vendetta this evening. The crowd in attendance was small & they were dead the whole show. The talent tried to do their very best to give those in attendance a show, drawing heat to some stars & others trying to start chants to get the crowd going but in the end it just fell flat on the crowd. Once again, I don’t take anything away from Vendetta or its stars because I know what they’re capable of, the matches were good & I support Vendetta Pro. 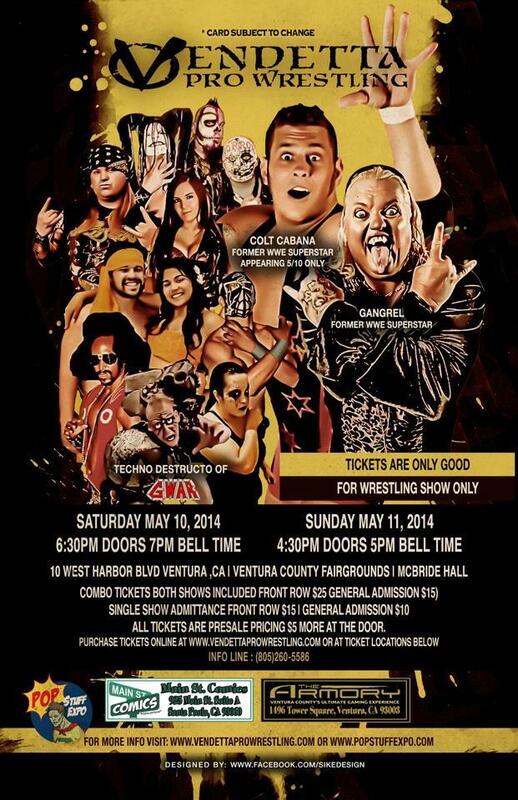 Once again, Vendetta Pro will be having Night 2 on Sunday, May 11th @5p at the Pop Expo Show in Ventura, Ca. Tickets are still available for the show. If you watch Vendetta, you know they have a great show & I know that despite if the Pop expo draws again, you the fans will enjoy a great show from Vendetta Pro if you attend. But I want to thank Vendetta Pro for having me there to cover the show as I enjoyed the show. Until Next Time, this is Mike Draven…signing off.